Should You Really Buy a Fixer Upper? I know that Joanna and Chip Gaines have decided to end their Fixer Upper show on HGTV. I have to admit, I’ve been kind of obsessed with this couple. Not only are they the sweetest things ever, but their homes, decorations, and what they can do with shiplap is unbelievable. But, it got me thinking about our own fixer uppers around here. What the term really means and who should be buying fixer properties. Here’s my take on buying a fixer-upper and if you’re considering buying one, what to look for. The term “fixer-upper” sounds appealing to those that want to put a little bit of elbow grease into a new house, but, the term “fixer” to a real estate agent could mean everything from cosmetic fixes and updates to full-on foundation repair, new electricity and a whole new roof and siding. You really have to understand what you are getting into if you choose a fixer-upper property. That being said, there are some things to help you make an informed decision if you plan on buying a fixer property. Understand what it is that you are looking for in a property. Do you want a great deal on a home that you just need to put in new flooring, paint the walls and maybe update the cabinets? That might not fall into the category of “fixer”. You have to be honest and communicate with your real estate agent about what you’re looking to do and how much effort and time you want to put into the house. Cosmetic isn’t such a big deal but larger projects such as outdated wiring, improper plumbing, an old roof, or foundation cracks, could mean thousands of dollars in repairs. You might have gotten a great deal on the house, but with all the additional expenses to make it livable, it may just not be worth it. What are you using the house for? Are you planning on living in the house is a permanent residency or are you planning on renting it out or flipping it for a higher price? This can greatly affect your decision on what and where to buy. There’s an old saying, “buy the worst home in the best a neighborhood”. This means that if you buy the worst home, it should greatly increase with a little bit of cosmetic repair and the increase the value of the homes surrounding the property. However, this is something that a real estate agent should be able to help you determine. Look at the value of the houses in the neighborhood; are they are priced much higher or have sold for a higher price? This might be a wise purchase. Buying the most expensive house in the neighborhood that still needs repairs, could potentially lose money on the backend. Will you be doing a lot of your own repairs? If you’re a contractor or you have a little bit of know-how when it comes to home improvement, you could save yourself thousands of dollars in labor by doing a lot of the work yourself. A couple that I recently sold a house to, purchased a property that was 50 years old and dated like it just came out of the 70s. Because the owner was also a construction worker, he was able to do a lot of the work himself and put in new flooring, cabinets, tile, appliances, woodworking, crown molding and windows, instantly increasing the home hundred thousand dollars. Get estimates before you finalize the sale. If you are planning on buying a home that will need a lot of work, try to get a good estimate on what that work will cost. Talk to a contractor, home improvement companies or stores to find out the materials you’ll need and the approximate cost of any upgrades. This will help you determine the value of the home and whether or not you’re willing to put in the work. Sidenote: a lot of the things in a fixer-upper may not be found until you actually start work. Mold, mildew or outdated wiring may not be found on an initial home inspection. It’s important to budget for unknown expenditures just in case. 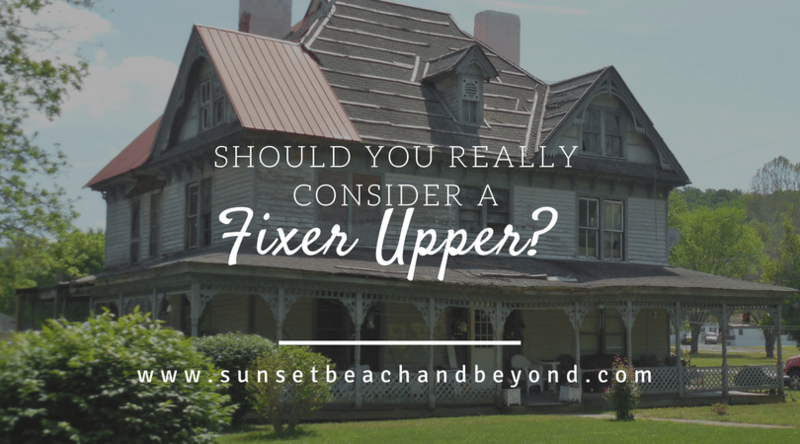 Fixer-uppers are a great investment if you have the time, energy, and know how to put in the work needed for the return on your investment. Again, it comes down to a great real estate team understanding what you are looking for and how to help you get it. Give us a call today if you’re interested in fixer properties around Sunset Beach NC.